Losing a loved one is never easy. Having to explain the loss and help a child deal with it can be very difficult. Here are some suggestions for making the grieving process a little easier for you and your child. The first step in dealing with grief is to recognize the many forms of expression it may take. You may feel depressed, sad, lonely, lethargic, and experience a lack of appetite. These expressions are common and easy to link to grief, but there are many other expressions that are harder to identify as grief-related. They include anger, aggression, ravenous appetite, lack of direction, lack of motivation, inability to focus on a task, short attention span, and forgetfulness. One of the best things you can do to help your child cope with his pain is to give yourself the opportunity to grieve and to allow him to observe your grieving process. It is important to accept now that you will be very fragile for the next year or more. During this time you will need to be very kind to yourself and to your family members. Pay careful attention to your child’s physical needs. Make sure that he gets proper rest, nutrition, and exercise. If possible, give him the opportunity to play out of doors. A combination of sunshine and being in physical contact with nature has a strong positive effect on our bodies as well as our emotions. There is no really “good” time to grieve, but most likely the pain of this loss will hit at the worst possible time. 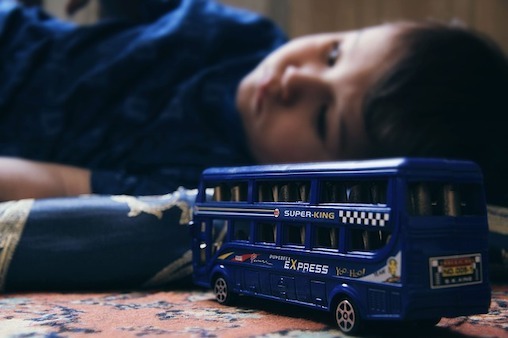 Whether your child is feeling anger, sadness, depression, or aggression, he will probably express his pain through temper tantrums or bouts of uncontrollable crying. By nature, this will happen when you are in a public place or have pressing obligations that are very important to you. This is not an accident. It is at these times that he will feel the depth of his loss most acutely. In general, you will want to handle these episodes much the way you normally would, however it is important that you recognize what is going on and make extra space for his pain. Your child may not be able to associate what he is feeling with his loss and you do not need to bring it up every time he acts out. In point of fact, it is important that you do not allow him to get in the habit of using this as an excuse to act out. You can also expect your child to regress as a direct result of the stress of losing a loved one. This may include waking up more frequently at night, excessive amounts of thumb-sucking, bed wetting, daytime incontinence, returning to baby talk, and, in severe cases, refusing to talk all together. These things are only temporary and your child will undoubtedly regain the skills and maturity level that he was functioning at if he is able to process his grief in a positive way. An excellent way to help him do this is creative play. This is accomplished by encouraging children to use puppets or action figures to act out what they are feeling. Children have the ability to project their feelings on inanimate objects much more easily than they can own them. It is also less of a risk for them to allow a toy to say what they really feel and watch others react to the toy than it is to risk rejection from the ones they depend on for their sense of self. Consider working together to compile a scrapbook of memories about your loved one. Include lots of photos and memorabilia, but focus on getting your child’s memories into tangible form. Ask him to draw pictures of the things he remembers, and then ask him to tell you about the picture. Write down whatever your child says and when he is finished, read it back to him. Give him the opportunity to add to or change what he says until it clearly expresses what he is feeling. In this way you will not only help your child capture memories that will be with him for the rest of his life, but you will help your son clarify his current feelings. Create a family video. Invite family members (and close family friends) to recount their memories of your loved one and tape them. A good time to do this may be at holidays or your loved one’s birthday. Everyone in the family will be missing them and they may welcome the opportunity to deal with their own feelings of loss. It is important not to put pressure on anyone to participate because some of the family may not be ready to be this vulnerable. It also does not need to be a great artistic work to be therapeutic. The last thing the family needs is pressure, but each individual does need creative ways to work through this significant life event that leaves each one who experiences it deeply changed forever.